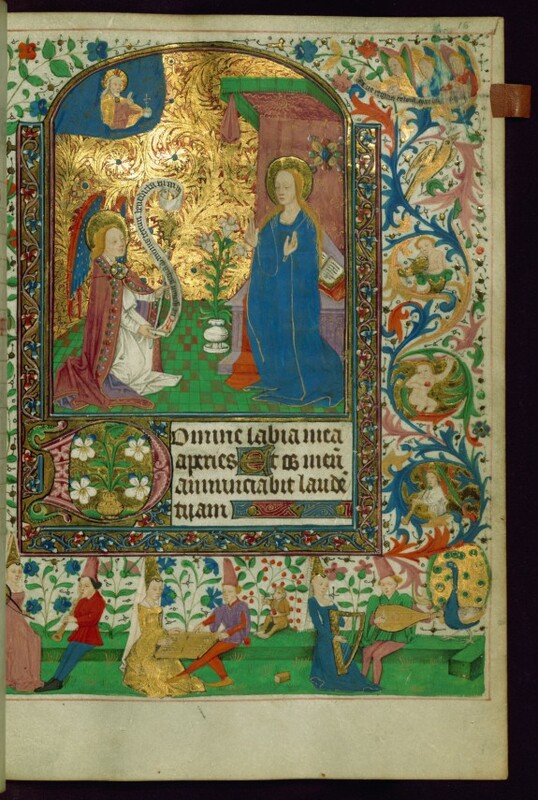 Description In a marginal illumination framing the Annunciation (the angel Gabriel's announcement to the Virgin Mary that she will give birth to the son of God), lovers play musical instruments and backgammon in a garden of love. 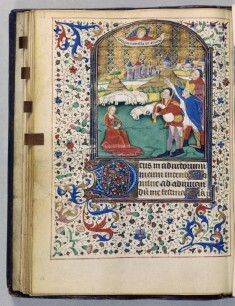 The profane pleasure garden is contrasted with the purity and sanctity of Mary's garden, the enclosed garden suggested by the gilded leaf pattern in the background. 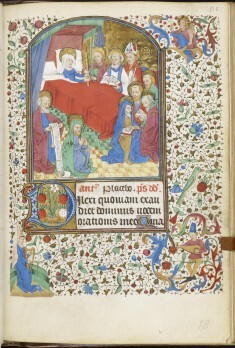 This Book of Hours was completed for Use of Reims ca. 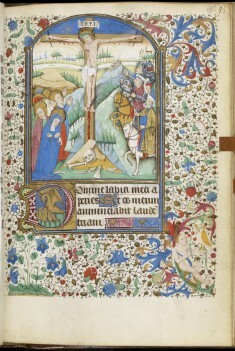 1450-1475 in northeastern France. 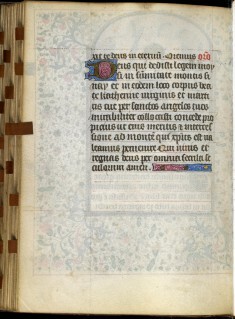 The book was first owned by Collette, who is portrayed on fol. 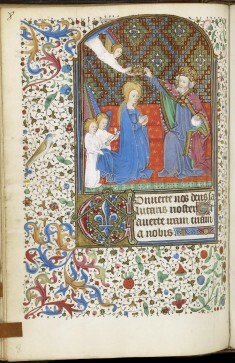 76r with the Virgin and Child. 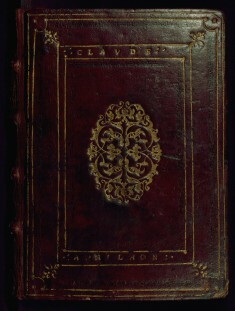 An inscription from 1559 on the back pastedown records later ownership by female owner G. Marlot, as well as by her aunt, née Labourgue, wife of the merchant Jean Bourguet, followed by G. Marlot's daughter, Martine Marlot. 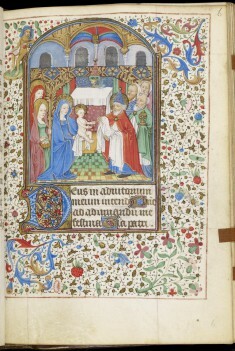 There is a large amount of unusual and specifically female content in the book, including a heightened amount of prayers to the Virgin, virgins listed in the calendar and litany, as well as the unusual inclusion of the Hours of St. Catherine. 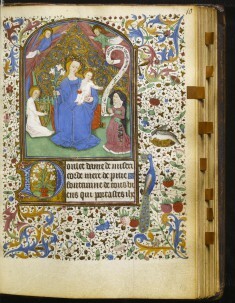 Making Music in Medieval Manuscripts. The Walters Art Gallery, Baltimore. 1988-1989. 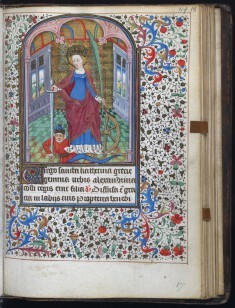 Decadent Decades: The Medieval Clothes Horse. The Walters Art Gallery, Baltimore. 1989. Medieval Games of Love and War. The Walters Art Gallery, Baltimore. 1995-1996. 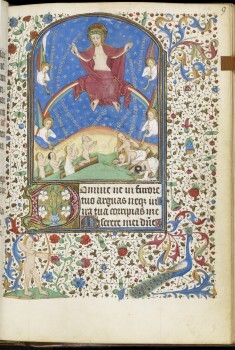 Music in Manuscripts. The Walters Art Gallery, Baltimore. 1996-1997.